The scene of the 2012 killing. A MURDER ACCUSED is alleged to have stabbed his former partner and mother of their two children after their “relationship turned sour”, prosecutors have told a trial jury. 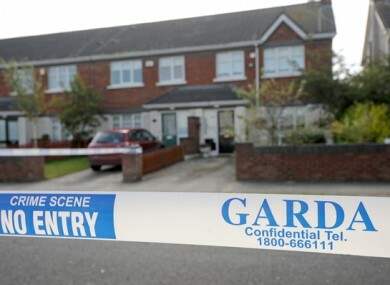 Vesel Jahiri (35), originally from Kosovo but of no fixed abode, has pleaded not guilty to murdering Anna Finnegan (25) at Allendale Glen, Clonsilla, Dublin 15 on 21 September, 2012. He has also pleaded not guilty to assaulting Karl Finnegan, causing him harm, at the same place on the same date. “This may be relevant to this case,” he said. Mr Marrinan said that Mr Jahiri was born in Kosovo and had lived in Ireland since 1999. He owned a garage and was a mechanic by trade. “He is an Irish citizen and was granted citizenship some years ago,” he said. Counsel told the jury that Mr Jahiri formed a relationship with Anna Finnegan when she was very young, in her mid to late teens. He said they were together for about ten years and had two young children. “They had a normal relationship but leading up to September 2012 the relationship turned sour and they ended up separating. Anna Finnegan had a protection order against the accused man. She had gone to Bray Refuge Centre with her two children and stayed there. In early September she had reconnected with the accused and they had some interaction,” he said. Mr Marrinan said that “effectively the relationship was over” and the accused man was “extremely concerned” about getting access to his children. “It was put in place by social services that Karl Finnegan, the brother of Anna, would stay in Allendale Glen in Clonsilla with her. She would be in his company in the evenings and arrangements were put in place where she was with her family by day,” he said. The barrister told the jury they will hear that Ms Finnegan went with her two children to The Wellman Clinic on the morning of 21 September and the accused was also in attendance. Mr Marrinan said that later that afternoon Ms Finnegan went to her friend’s house with her two children. He said the jury would hear evidence of a telephone call from the accused that afternoon. Counsel said the jury will hear that Ms Finnegan went home that evening and was sitting at the kitchen table with Karl Finnegan, having a cup of tea and a chat, when the front door was battered in. “You will see evidence of that,” he said. He said that Karl Finnegan was struck twice with the knife. “Once causing a fracture to the orbit of the eye and there will be evidence that he suffered a stab wound to his chest area,” he said. Counsel told the court that Karl Finnegan felt faint and he may have gone unconscious but he was aware that Anna fled from the house and had gone outside. “He (Karl Finnegan) was also aware of the fact that the accused man had gone out after her. He (Karl Finnegan) followed them both and you will heard evidence of what happened outside. There is no one in the case who will say they saw the accused man stab Anna. You are entitled to draw inferences from known facts,” he said. The barrister said that Ms Finnegan then collapsed in the driveway and the accused man went to his motorcar. “There will be evidence from two eye witnesses who will tell you what they perceived happening, whether their evidence is accurate is entirely a matter for you and you can decide what weight you will attach to that evidence,” he said. Mr Marrinan said the jury will hear evidence that Mr Jahiri came back in his car, put Ms Finnegan into the back and drove her to James Connolly Memorial Hospital. “You will remember what I said in regards to the charge of murder. It is the prosecution’s case that it is very clear that the accused man having stabbed Anna Finnegan immediately regretted it and brought her to hospital but that doesn’t absolve him,” he said. The court heard that hospital staff attended to Ms Finnegan. Mr Marrinan said Mr Jahiri then went off in his car and subsequently paramedics attended to Karl Finnegan at the scene. Counsel said the jury will hear evidence that Mr Jahiri rang 999 later on and spoke to an operator. “You will hear the transcript of what he had to say in that conversation,” he said. Mr Jahiri handed himself into Cabra Garda Station the following day and he was arrested, he said. “When he handed himself in he brought the knife with him and gave that knife to gardai, a knife he claimed at the time he had taken from Karl Finnegan when he was acting in self-defence. You will hear evidence of the examination of that knife and what was found on it,” he said. “It is in actual fact that he went to the house to give some money to Anna Finnegan and wasn’t allowed access to the house. He admits he broke down the door. He says he was confronted by Karl Finnegan who had a knife or knives. He says he managed to take a knife off Karl Finnegan and stabbed him but he only did so as Mr Finnegan had a knife and he [the accused] did so in self-defence,” the barrister said. The barrister told the court that Mr Jahiri denied that he stabbed and killed Anna Finnegan. The trial continues tomorrow before Mr Justice Paul Coffey and a jury of nine men and three women. It is expected to last between four and five weeks. Email “Man pleads not guilty to murdering ex-partner and stabbing her brother”. Feedback on “Man pleads not guilty to murdering ex-partner and stabbing her brother”.